Rode my new bicycle yesterday for the first time. It felt great too! It’s not an expensive bike by any stretch; I only paid $250 for it. So, of course it has some minor issues. Nothing a tune up at a reputable bicycle repair shop won’t fix. I’ll take care of that soon enough…probably by the end of the month. The main issue is that there is some slippage of the gears. I think that the chain is possibly the wrong size. A tune up should fix that. While I was riding, I actually felt like I was a “real” cyclist, being on a road cycle and all. Riding an actual road bike, it didn’t feel all clunky and awkward like I now realize riding my modified mountain bike felt. 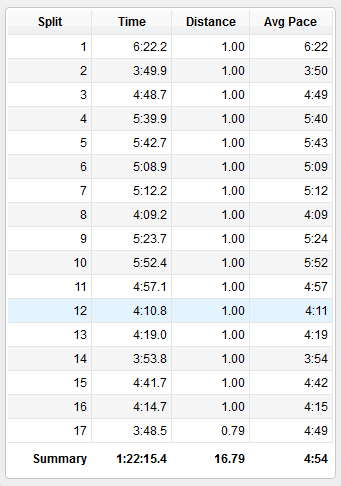 The other thing was that I felt comfortable going at the faster speeds that I would go, say, on the downhills. 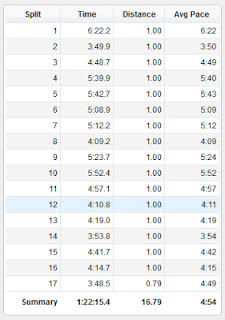 As you can see from my Garmin data, I was going pretty fast, as fast as a 3:15/mile pace (that was part of the 3:22 mile). 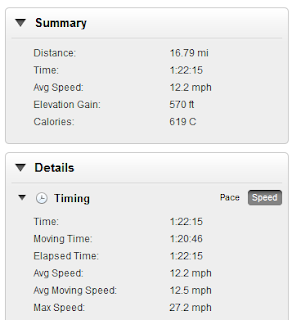 That translates to about 18mph sustained for an entire mile. 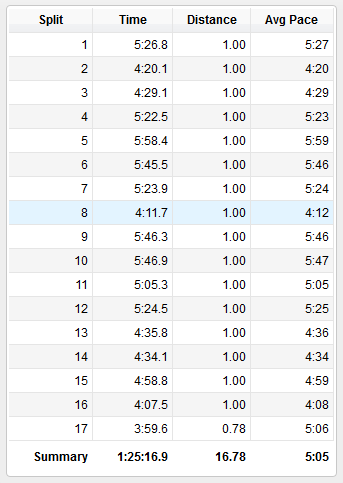 However, my fastest, as you can see, was over 27mph!!! And I didn’t even bat an eyelash and freak out and clutch at my breaks like an alcoholic clutches at a bottle…like I would do on the modified mountain bike. To sum it up, I felt like I actually belonged on the roads yesterday. I haven’t decided if I’m going to fix up the mountain bike and turn it back into a proper mountain bike…with knobby tires and all. I don’t see that I would have much use for an actual mountain bike. While I think I would enjoy trail running, I don’t really like trail riding. There are too many obstacles that pop up without warning…like trees. My plan to run 4 miles this morning between getting home from work and having to be at that American Cancer Society appointment fell through. At around 5:15 this morning, toward the end of my overtime shift, I started realizing just how tired I was and that if I ran I would just be inviting injury. So I opted to just nap instead. So, this evening, after another nap (this one a few hours long instead of just an hour), I went for another bicycle ride. 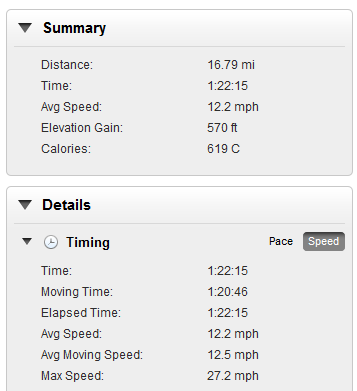 Same distance (16.8 miles). Instead of shifting when I encountered hills like I did yesterday, I just stood up and climbed instead. I burned more calories today than I did yesterday for the exact same ride, so I know what I’ll be doing on future rides! I really am enjoying the new bike and look forward to next Saturday maybe tackling that 23.5 mile route I’ve been wanting to do.